A DLC-mod which alters each class's Fitness in order to make the classes feel a little more unique, as well as increasing the weight capacity limits for each class. 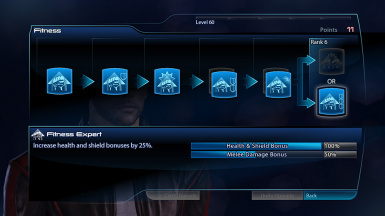 This was originally a personal mod that I developed for myself, but I've decided to share it with the community - this mod attempts to keep the classes more in line with how they were in both ME1 and ME2, by changing the health/shields, melee damage, and shield regen of each class's Fitness (meaning Soldiers now have the highest health/shields, while Adapts and Engineers now have the lowest health/shields). Additionally, this mod increases the weight encumbrance limit for each class to give them all a little more leeway with what kind of weapons that players want to equip. 2. No, seriously, I don't have to fiddle with ME3Explorer at all for this to work?